Anti-shock assemblies are used to protect the upper and lower balance pivots from damage due to external impact on the watch. In some movements, shock assemblies are also used on the escape wheel. 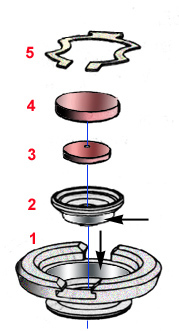 A typical anti-shock assembly consists of (1) the block, (2) the jewel housing, (3) the pierced jewel, (4) the cap jewel, and (5) the retaining spring. The tip of the balance pivot extends through the block, jewel housing, pierced jewel, and rides on the under-surface of the cap jewel (as shown by the vertical blue line). The retaining spring holds the cap and pierced jewels and their jewel housing in place in the block. The jewel housing and block have polished surfaces (arrows) that allow the jewel housing (the thus the balance pivot) to displace laterally during horizontal shock. During vertical shock, the retaining spring allows the cap jewel to rise and relieve stress on the pivot. The retaining spring returns the entire assembly to normal position after the shock.